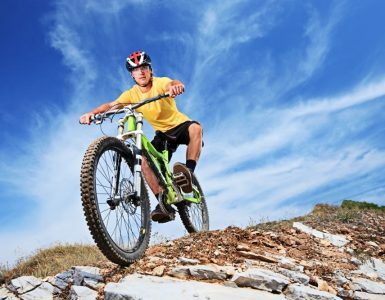 Want to get started mountain biking? Great! It can look somewhat intimidating, as you do need a minimum amount of gear to get started. It’s not as expensive or scary as it looks though. 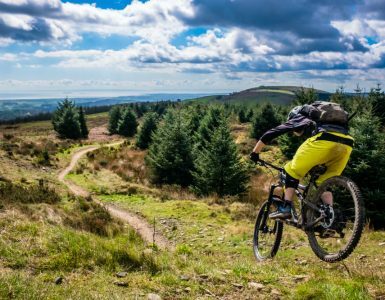 Here’s what you need to start mountain biking, and get involved in an ever growing scene. A rigid bike is one with no suspension. They’re lighter and offer less moving parts, meaning less maintenance for you as you’re first starting out. However, they’re not going to be as comfortable on uneven or rocky terrain. They are cheaper though, so if you just want to get started, this will be the model for you. These bikes have suspension in the front, while the back fork is rigid. This kind of bike is heavier than a rigid bike. They’re a great beginner option though, as they’re still affordable while giving you some amount of control. You should be looking at £400 upwards for this style of bike. As the name implies, these bikes have suspension on the front and rear forks, making them a comfortable ride. They’re also easier to control on terrain that’s uneven. These can start costing around £800, so they are a serious investment. You can buy one of these as a start bike if you know you’re going to be doing a lot of biking, or you’re looking to get started on terrain that needs full suspension. Whatever you go for, ask the staff in your local bike shop about your options. They’re often biking enthusiasts too, and they’ll have lots of advice and ideas for you before you hop on that bike. If you have one piece of protective gear on you when you’re out biking, it needs to be a helmet. Mountain biking is a fun sport, but it can also be dangerous. If you come off your bike and hit your head, you can do yourself a lot of damage. A helmet mitigates that, and can keep you safe when you need it the most. Again, you’ll want to go to a bike shop and try on several models, as they will all fit differently. As a guide, they should fit fairly snugly on your head, and not move back and forth too much. It should sit above your ears, and not obstruct your vision. Ask for help if you’re not sure which helmet to buy. Another tip too, once you’re out on the track: if you do fall and hit your head while you’re wearing a helmet, you’ll want to replace the helmet. This is because it’s taken the impact of the hit, and therefore the damage. If you wear it after hitting your head, it may not protect you if it happens again. You may not think of this as an essential piece of kit, but you’ll be glad you’ve got them once you’re out and biking. As a new biker, you may crash more than normal. This is totally ok, but you’ll want the gloves to protect your hands when you fall. After all, you’ll put them out to save yourself without even thinking! They’ll also reduce soreness in your hands from gripping the handlebars. In the summer, fingerless gloves are fine, but in winter you’ll want those full hand gloves. You’ll be happy you’re wearing them when your hands are snug, cosy and safe! When you’re on the track, you’re going to need some way of staying hydrated. Try biking without water for long, and you’re going to have a bad time. Many bikers have a water bottle cage on their bike frame, which gives you a handle place to store a good water bottle. It’s easy to grab when you’re on the go, and stops it from getting jostled around in your backpack and possibly leaking. However, some bikers feel that this doesn’t hold enough water for them, and so they invest in hydration packs. These look like regular backpacks, but they hold water that you can sip through a tube without stopping your ride. Either of these options are great for bikers, so pick one when you’re starting out. Either way, you need to have water with you on every bike ride. Sunglasses are always a good option when you’re biking, to keep the sun out of your eyes when you’re on the track. They’re also essential as they can stop dirt and grit being flung into your eyes. It’s amazing how much can be flung up when you’re biking, and if it gets in your eyes you’re going to have to stop to wash it back out. You can buy glasses designed especially for bikers, so try a few out before you make the purchase. Nobody wants to be stuck with a puncture, and there’s nothing worse than having to ask around if anyone else has a kit. Keep a puncture repair kit on you, that has things like a hand pump, inner tubes and patch kits. These will all keep you going even if you do fall foul of a sharp rock. Again, you don’t want to be without this when you need it the most. 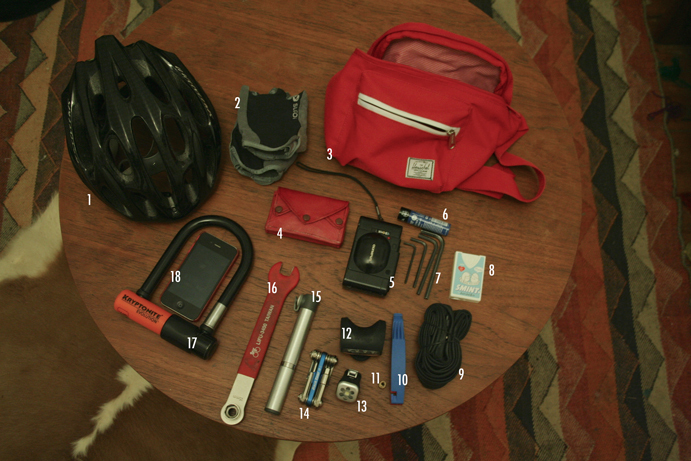 A good portable first aid kit can help with a lot of minor injuries, and keep you biking. Make sure it’s fully stocked up before you head out on a ride. You’ll want your phone on you, in case of emergencies. You never know when you may need to make a call. If you’re worried about it getting damaged, invest in a super tough phone case for it. You’ll also want a charged portable charger in case the battery runs down. Obviously you’ll need to be wearing something when you’re out on your bike! Regular workout clothes sound like a good idea, but they can get wet and clammy quickly, making them very uncomfortable. 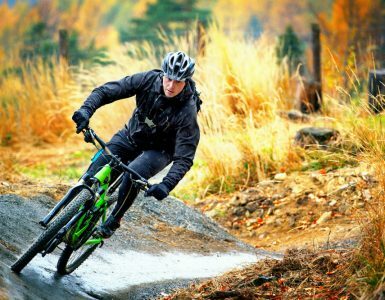 Instead, you’ll want biking specific clothes that are designed to draw moisture away from the body, and keep you at a comfortable temperature. Biking tops come in all sorts of shapes and sizes, so shop around and try them on before you buy them. You want to ensure you’ve got plenty of mobility, especially around your arms and shoulders. Also, check that it doesn’t ride up if you raise your arms, so you don’t end up with a cold midriff. As well, cycling shorts are a must. Long hours on the bike can be sore, and good shorts now come with padding to prevent this. You can wear baggy shorts over the top of them if you want, but it’s up to you. You don’t even need to spend a lot of money if you’re only out for a few hours a week. Now you have all your equipment, you’re going to need somewhere to try it all out. If you have a local trail nearby, get on your bike and go check it out. If you don’t, local parks and even the roads can give you somewhere to put your time and get used to your new bike. You can find trails by attending competitions and races near you, too. You may find that there’s trails near you that you never even knew about. When you’re out on your new bike, you don’t want to do it alone. Find a friend who’s also new to biking, or someone who has some experience and can show you the ropes. You’ll be amazed at how much having someone else there will motivate you. When you want to quit for the day, they’ll be able to push you that little bit further. Having a friend who’s new to biking too is great, as you can learn together and you have someone who’s skill set is comparable to yours. A veteran biker is a great partner too, as they know all the tips and tricks that make biking that little bit easier. Now you know everything that you need to have to hand before you start mountain biking. It looks a little intimidating, but you can shop around and get good prices on the equipment you need. Don’t forget to ask for advice in local bike stores, as the staff can help you find exactly what you need.